This is a book, where I knew the title and had a smattering of an idea of what it was about. I'd heard of the movie, but wasn't sure if I'd ever seen it. I just knew that it stared Gregory Peck wearing glasses. Oh, and it was a classic that my son had loathed reading for English. So I wasn't really expecting much. In fact I thought it might get returned to the library before I'd waded through it. Well, for all of you who have never read it, go out and get yourself a copy. 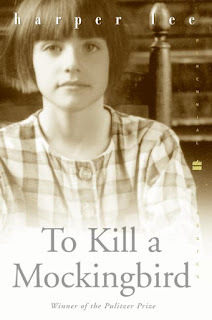 This is a superbly written gem of a story, about a girl in Alabama in the 1930s. Her name is Jean Louise Finch - Scout for short. The book begins when Scout is six and finishes when she's eight. Scout, her older brother Jem and their friend Dill get up to all the usual childhood high jinks. Boo Radley lives down the road, but no one has ever seen him. Scout wants to - just once, and the three friends come up with lots of daring adventures to bring him out of his house. Atticus Finch, Scout's father, is a lawyer and he's called upon to defend Tom Robinson - a black man. Atticus is a loving, wise and upright father and citizen, but he come's against the prejudice of the town when he stands up in court for Tom. One could argue it's an age old story about prejudice, but there is a freshness to it, that held me spell bound. And Scout is a delightful character to read. "A first novel of such rare excellence that it will no doubt make a great many readers slow down to relish more fully its simple distinction ... A novel of strong contemporary significance." Chicago Tribune. "Novelist Lee's prose has an edge that cuts through cant, and teaches the reader an astonishing number of useful truths about little girls and about Southern life." Time. Thanks for this. It's going on my Christmas holiday pile. I have a few cosy mysteries and now this. Joanne, I'm sure you'll enjoy it.